Join community leaders, school officials, health and transportation professionals, law enforcement officers, parents and neighbors for this opportunity for Herndon Middle School. The course provides participants with the knowledge and skills to develop sound SRTS Programs based on community needs and conditions, best practices and responsible use of resources. The day concludes with participants developing an action plan. The course is offered free of charge with lunch and snacks provided. Course size is limited so register early. Online registration available. 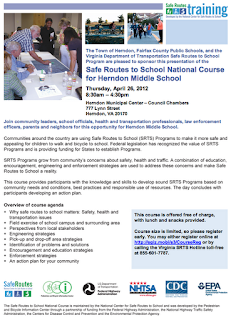 See a copy of the SRTS training flier. See an earlier FABB blog post about the bicycle program at Herndon MS.
"We’re focusing mostly on biking for transportation," he said. "We started in June 2011 and will finish this June. Then we’ll recommend a proposed bike-network plan to the Board of Supervisors in June or July. 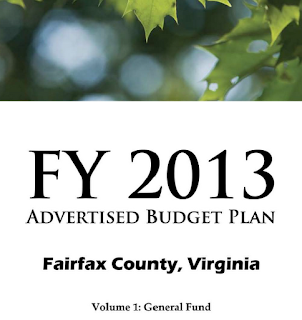 We hope to have it incorporated into the [county’s] Comprehensive Plan and into the City of Fairfax’s plan." "Using bikes for transportation is an important part of our vision for the future," said Goodman. "We know Fairfax County is competing with other cities for jobs, and these are the types of things that could reel in potential employers." At the National Bike Summit there was a session entitled Finally the racing and advocacy worlds collide. See a report of that session at examiner.com, Bike advocates and pro cyclists bridge the gap at National Bike Summit. Johnson suggested to specific ways that the USA Cycling race clubs could be involved in advocacy and promoting bicycling. First, he suggested that each USAC club adopt a school, "and it doesn't have to be an underprivileged school," to go and talk to kids about bike safety and show them the fun side of bike riding. He said,"When you're a kid, your not riding a bike to train or commute, you're riding because it's fun!" Second, he suggested that amateur cyclists talk to other parents informally about advocating for bike lanes and Safe Routes to School, "just talk to people on the sidelines of your kid's soccer game," he suggests. Self-described Bicycle Evangelist and Bikes Belong member Richard Fries noted that the President of the League of American Bicyclists, Andy Clarke was in the audience, then bombastically asked, "Where are all the other bike advocates, why aren't they here?" He gave examples of advocates not wanting to talk to him about racing. Gary Fisher stood up, removed his hat, and interrupted Fries: "Advocates are the ones working hard the ground, the pros are WHOOSH, just flying overhead. We racers need to RESPECT the advocates." The audience erupted into spontaneous cheers for Fisher. Fries hadn't realized how many grassroots advocates sat in the audience from places like Arizona, Georgia, Virginia, California, and many other states. VDOT will be repaving 24 miles of the 32-mile, six-lane Fairfax County Parkway between Route 7 in Dranesville and Rolling Road in Springfield. While the road has been repaved several times, the paved sidepath has never been repaved. The trail is in very poor, dangerous condition and should be repaved. Cyclists should attend the repaving meetings to ask that the trail also is repaved, either as part of this project or concurrnetly as a separately project. Three FABB members recently rode the length of the trail and identified the many sections like the one above where there is cracked and crumbling asphalt wide horizontal gaps, raised utility covers, and other problems with the trail. We collected GPS points and photos and submitted that data to VDOT so they could prioritize repaving locations. It's our hope that major sections will be fixed this summer. Attending the above meetings will help get that message across. 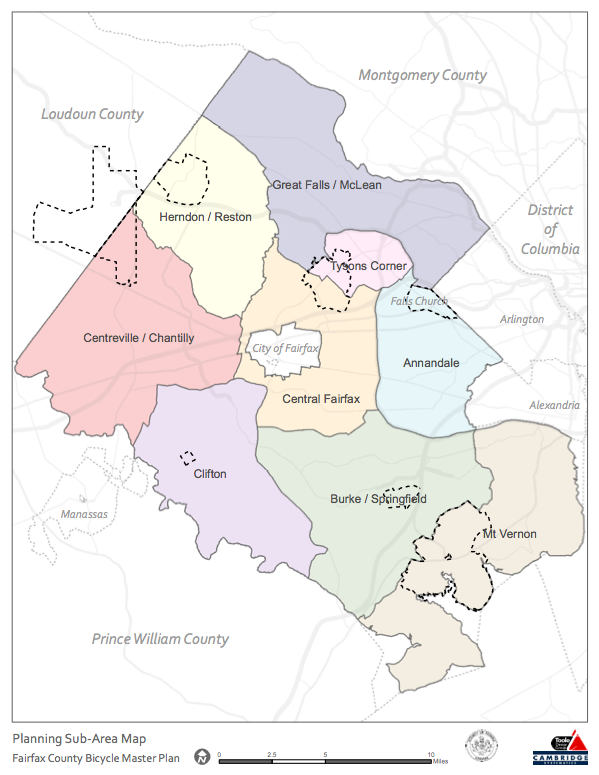 The last of eight bike plan meetings focusing on different parts of the county will be held in Central Fairfax on Thursday, March 29 starting at 6pm at Daniels Run Elementary School, 3705 Old Lee Hwy, Fairfax. 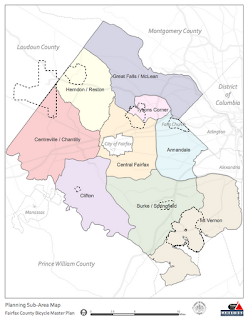 Technically the planning area does not include the City of Fairfax, but given it's central location and the fact that several countywide bike routes pass through the city, it makes sense that the city be included in the process. While there will be additional public meetings, this is one of the last chances to make detailed comments on the bicycle route network, on bike parking needs, and on any bicycle-related policy recommendations. Comments need not be limited to just the Central Fairfax area. As a side note, the photo that has been used for most of the fliers advertising the bike plan meetings (the center photo in the flier on the right) was taken in the City of Fairfax on a ride organized by city residents to review possible bike routes between the city and the Vienna Metro station. George Mason University is located nearby and the potential for future bike use is significant. We just need better, safer bike facilities and having a good bike plan is a critical part of the process. See the Central Fairfax meeting flier and the Bike Plan website for more details. 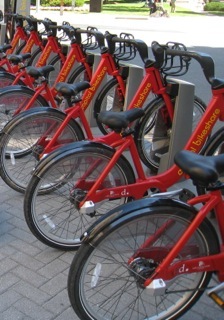 Is bike sharing feasible in Reston? I think the answer is yes. First let me explain what bike sharing entails. The concept refers to having a group of bicycles that are available to the general public, either for free or rented by the hour. The best example in our area is Capital Bikeshare. You may have seen the red three-speed bikes that are now very common in DC. Users must first become members of Capital Bikeshare. Memberships are available for a single day, three days, 30 days, or a year. The first half hour is free, after which hourly fees apply. This pricing encourages shorter trips. Once a bicycle is checked out it can be returned to any of the 140 stations scattered throughout the DC/Arlington area. In order to be a useful transportation alternative, a sufficient number of stations located relatively closely are needed. Users don't want to walk long distances from the stations to their destination. Ideal spacing is about 1,000 feet between stations. With the coming of rail to Reston, many people will be traveling short distances to and from the Wiehle Ave and Reston Parkway rail stations. The "last mile" is a term used to refer to these short trips to/from transit. Bike sharing is an ideal solution. Where would the bike stations be located? A start would be to have stations on the north and south sides of the Metro stations. The Reston Pkwy station is a long walk from the Town Center so a couple of stations could be located in parts of the Town Center. Other obvious locations include the USGS, Reston Association, Hunters Woods Village Center, the International Center, South Lakes Village Center, Newton Square, Plaza America, Stratford House, and other high density residential and commercial locations. How would the system be funded? The Capital Bikeshare system is funded through federal, state, local and private funding. The Paris Velib bike share system is funded using advertising at the stations and on the bicycles. We currently fund other forms of transit, and bike sharing can be envisioned as a small-scale transit system that need not be self supporting. Even so, the Capital Bikeshare system is now taking in enough funds to pay for all operating expenses. The next time you plan a short trip, think about how that trip could be taken by bike, and if a shared bike were available, would you use it? Bike sharing could be a real option for many people in Reston, but we'll need safer, more direct on- and off-road bike facilities for it to be successful. That's the topic for a future article. One of the most crowded park and ride facilities in Fairfax is the Herndon-Monroe parking garage. Renovations to the garage begin this week, which means there will be a lot of disappointed motorists looking for a place to park. We've got just the solution. Why not bike there? Bike parking is plentiful and under cover. There are several bike lockers there as well, available through Fairfax County. Bicycle access to the station could be better. There is a paved trail to the east but it turns into a narrow concrete sidewalk leading to Fairfax Co Parkway. To the west the trail ends abruptly before reaching Monroe Street. While we usually have no major problems riding on the four lane road leading to the station, during rush hour motorists can be very impatient and aggressive. The sooner the county improves access to transit, including the future Silver Line stations and busy park and ride lots, the better off we will all be. David Alpert of Greater Greater Washington writes in today's Post about how the Park Service is becoming more accommodating to bicyclists: A thaw at the Park Service opens up possibilities in D.C.
Today, however, you can pick up a Capital Bikeshare bicycle in Foggy Bottom, Capitol Hill, Petworth or Crystal City and ride to the Washington Monument or the FDR and MLK memorials. 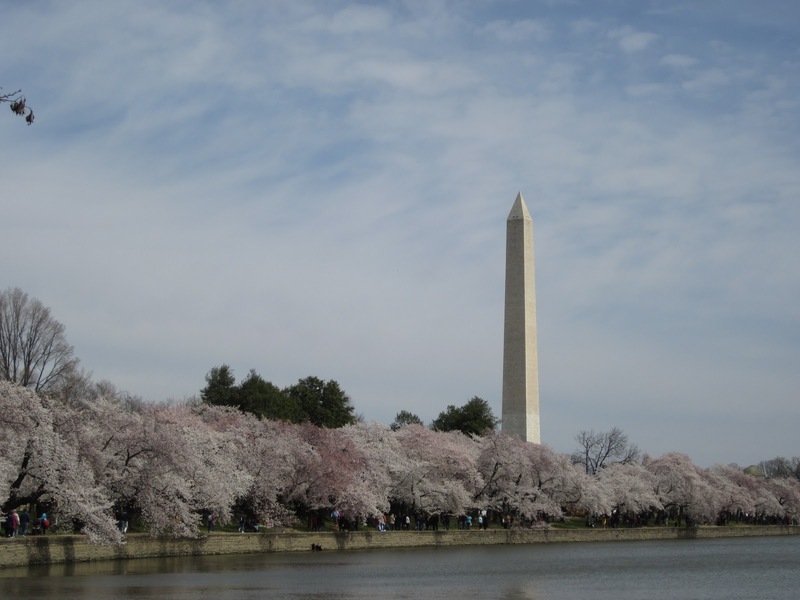 Once there, you can drop off the bike, enjoy the beauty of the cherry blossoms, then grab another bike for a ride home, to the Metro or to a restaurant. It costs just $7 for a day pass and is free with a longer-term membership. The BikeDC community ride found that it could use Rock Creek Parkway for its May event, after being turned down in the past. Apparently the new Rock Creek superintendent didn’t get the memo about being hostile toward people recreating in a beautiful valley on weekends. When cyclists gathered in the District last week for the National Bicycle Summit, Park Service head Jon Jarvis agreed that “we haven’t been all that bike-friendly in all our parks over the years” and pledged to change that. The Park Service deserves a great deal of credit for this refreshing change in attitude, but a long list of tasks remains undone. Capital Bikeshare is a great start, but there are still many more steps to make bicycling safe and convenient on our parkland. Try to bike from the Washington Monument down to the 14th Street bridge, and you either have to use a narrow sidewalk and dodge tourists on foot (who have a greater right to the sidewalk than you) or brave a road designed like an expressway. The paths alongside the George Washington and Rock Creek parkways are too narrow and winding, and especially on weekends, all the walkers, joggers and bikers have to wrangle over small spaces while light traffic zooms past. Why not make just one of the four lanes on each parkway a bike-pedestrian pathway on weekends? Fairfax County is conducting a transit study that includes a survey of residents "to determine how public transit system expansion plans can best serve the county's long-term economic growth objectives. Transit systems can be designed to serve many different objectives. 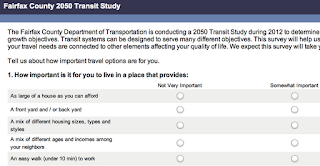 This survey will help us understand your needs and preferences for traveling within or through Fairfax County and how your travel needs are connected to other elements affecting your quality of life." It's a wide-ranging survey that asks about quality of life issues such as living in walkable, mixed use communities, the importance of access to transit, and the importance of providing better biking facilities. Is it more important to be able to walk to local destinations or would you rather have a short drive? While a few of the questions mention biking, it isn't really treated on the same terms as walking, driving and transit. An example is the questions that asks "How far would you be willing to walk on a regular basis from home" but no mention of biking from home to cover much greater distances. There are also no questions about the importance of bike parking at transit centers or about the integration of bicycling and transit. We suggest you take the survey and weigh in on these topics. As bike-riding population grows, D.C. tries to keep pace is the title of an article in the Metro section of today's Post. One way that WABA is trying to help is by providing bike education classes for these new riders. See their full calendar of upcoming classes, although none are available in Fairfax. I occasionally teach for WABA and so I attended a session for WABA instructors held last night at WABA's offices in Adams Morgan. To get there I rode my beater Metro bike to a nearby bus stop, parked and took the Connector bus to West Falls Church where I caught Metro to Foggy Bottom. When not traveling with my own bike I prefer to use CaBi once in the District. The SpotCycle mobile app is a great way to find stations and check availability of bikes. Unfortunately the apps wasn't working while I was riding Metro in the city. After arriving at the station I quickly found that there were no bikes available at the CaBi station near Foggy Bottom. According to the app, almost all nearby stations were empty. The one station with bikes was near Farragut North, but after walking there I discovered that the one bike at the station wasn't working. I continued walking toward Dupont Circle in hopes of finding a bike. At M and 18th St the station had two bikes and three people wanting to rent. It was a race to see who could check out a bike first. Fortunately two more bikes arrived and there were bikes for everyone. It was impressive to see how many people were using bikes last night to get around. DC is making great strides by providing new bike facilities all over town. The ride to Adams Morgan on Columbia Rd is now a little easier where the center turn lane was recently replaced with two 5-foot bike lanes. At the CaBi station near the WABA office I had a different problem; that station was full so I rode on to find an empty stall at a nearby station. Needless to say I was late for the meeting. I'll try to remember to check SpotCycle earlier next time. 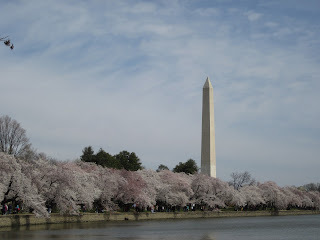 See the GreaterGreaterWashington article What's better: More CaBi stations or bigger ones? on the challenges of making bikes available to everyone. See another recent article on CaBi District homeless get help renting bikes. Riding my bike to a meeting the other day, I suddenly realized how happy I felt. Being so close to nature was wonderful, amid crimson cardinals darting through the underbrush and the sound of rushing creeks, but there was more to it than that. I had an exhilarating sense of freedom. Those and other fascinating tidbits from the history of women and bikes were provided by Sue Macy, author of the book Wheels of Change and keynote speaker at the first-ever National Women Cycling Forum, held this week in Washington, D.C.
Several members of FABB plan to attend the National Bike Summit that starts today in DC. Bike advocates from around the country will gather to learn about the latest strategies for promoting bicycling. Attendees will convene on Capitol Hill to lobby Congress on Thursday. You don't have to attend the Summit to join advocates on the Congressional visits. If you can attend and live in Congressman Wolf's district, more advocates are needed for that meeting. Contact Allen Muchnick of Virginia Bicycling Federation for details. I am able to attend thanks to a generous donation from the Reston Bike Club, sponsors of the popular Tues/Thurs rides in Reston and Herndon and the annual Reston Century. After the Summit I'll give them an overview of the Summit and will relay the latest news about the Transportation Bill. FABB's Fionnuala Quinn helped organize one of the kick-off events, the Women's Cycling Forum, that is being held today from 2-4pm. Bicycles are not allowed on Metro during rush hour. While most trains are very crowded during this period, but many are not, especially reverse commute trains. Not being able to use Metro during the time when many of us travel is a real disincentive to using bikes for those last mile trips to and from Metro, especially with the high theft rates at Metro stations. A petition is now available on Change.org to "Repeal the ban on bikes/ bicycles on the Metro during rush hour." Other transit systems have figured out how to accommodate bikes on their train systems during rush hour. The operators of the Los Angeles system have developed a set of rules that apply to bicyclists to accommodate them during rush hour and all other times. The main rule covers the major objection to bikes on Metro during rush hour: "If an arriving train is full, please wait for the next train. Never force your bike into a crowded train." The LA Bike Metro site provides lots of great info for cyclists. It's an example for others. As an aside, I learned about being able to take bikes on the LA Metro systems while reading the excellent interview with actor Ed Begley Jr. in Bicycle Times. Ed uses his bike for most trips around the city. He extends his range using Metro buses and trains. Unfortunately I couldn't find the interview online. See our blog post about riding with Ed when he was in town a few years ago. Spokes Magazine is available for free at most local bike shops. It's a great resource for cycling information in the Mid-Atlantic area. The magazine was started 25 years ago by Neil Sandler, the editor and publisher, after he saw similar magazines on a trip to California. Neil pays tribute to the many local bike shops that have supported him over the years, including Northern Virginia shops Spokes, Etc., Revolution Cycles, A-1 Cycling, Bonzai Sports, WheelNuts, bikes@vienna, and The Bike Lane. Most of these shops have also supported FABB. Congratulations to Spokes and thanks for the many informative articles over the years. The Making of "Where to Bike, Washington DC" - How Matt Wittmer, in DC after spending two years in Peru, happened across an ad for a write and photographer to put together a guidebook for DC area cyclists. He spent the next two years writing this very informative and attractive guide to local bike rides. New Year's Salute to Paul Rossmeissl - Paul, an avid local cyclist, lost his life in a tragic crash on the W&OD Trail in 2006. Paul's Ride for Life, starting in Reston on Saturday, April 28, is held in his honor. The Carless (Not Careless) Suburban Mountain-bike Ride - Mike Miller discusses the benefits of riding to his ride instead of fighting traffic and burning gas. He mentions several good mountain bike rides here in Fairfax and his experience riding to them from his home in Arlington. Be a PAL - Chris Eatough of BikeArlington discusses being a PAL: Predictable, Alert, and Lawful. Whether biking, driving or walking, everyone needs to exhibit due care, awareness and courtesy. Calendar of Events - Check out the many rides coming up this spring and summer. Look for copies of Spokes at your local bike shop. On Tuesday Charlie Denney of Alta Planning & Design/Alta Bike Share discussed the feasibility of a bike sharing system in Tysons, similar to the very successful Capital Bikeshare in DC run by Alta Bike Share. The presentation was sponsored by the Tysons Bike Group, an informal gathering of bicycling enthusiasts formed by FABB and TYTRAN. See our earlier post about the talk. According to Charlie, the DC system cost $6.4 million, mostly from Federal Congestion Mitigation and Air Quality Improvement (CMAQ) funds matched by 20% local funding. It consists of 140 stations and 1200 bikes. Arlington's system cost $800,000 and consists of 26 stations in Crystal City and Ballston/Rosslyn Corridor. There are 19,000 members which is double the projected number. There have been over 1.5 million trips that average about 1 mile in length. There have been 20 reported crashes and 10 bicycles have disappeared and not recovered. The bike share system would be focused around the four Metro stations which are located along Routes 123 and 7. These wide, pedestrian and bicycle unfriendly streets present major barriers for bicyclists. Bike share stations would need to be located on each side of the Metro station. Other stations would be located near major residential, employment and retail/commercial destinations. Using a bike for short lunchtime trips would reduce congestion and save employees time. There is currently no dedicated on-road bicycle infrastructure in Tysons. While many cyclists do ride there, most people will be reluctant to use bicycles without some dedicated space such as bike lanes, cycle tracks, or indications of shared use such as sharrows and "Bicycles May Use Full Lane" signs. The Tysons Bicycle Plan needs to be approved and implemented, and the planned redevelopment projects need to include bike infrastructure. The bike share system would need to be promoted by TYTRAN, FABB, the Tysons Bike Group, VDOT and DRPT, and others. Major land developers are logical sponsors as are Fairfax County, VDOT, the Tysons Partnership, and major Tysons employers such as Booz Allen, SAIC, Freddie Mac, PwC, etc. Bike sharing in Tysons is an exciting prospect but major changes are needed before it could become a reality. 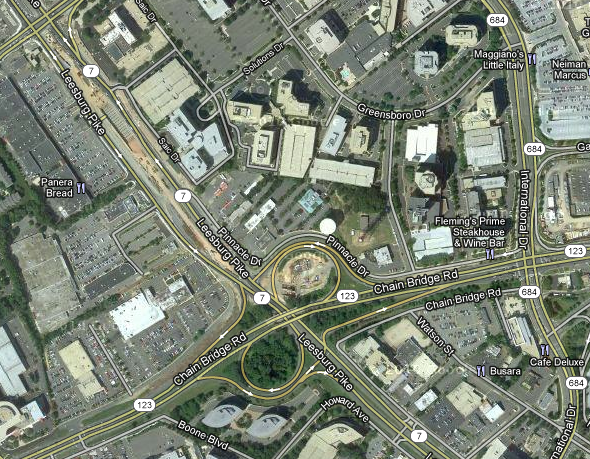 The fist step is implementation of the Tysons Bicycle Master Plan. We had a lively discussion about bike conditions during the presentation at the Centreville/Chantilly Bike Plan meeting held last night. About 25 people were on hand to mark up maps showing barriers, gaps, destinations, and roads that need bike facilities. Dan Goodman of Toole Design Group gave the presentation, noting that 60% of the county field work is completed. After the area meetings, several focus groups will be held based on thematic areas. FABB provided a list of groups in Fairfax that are or could be bike-related. Examples include health community/hospitals; law enforcement agencies; business/Chambers of Commerce/developers; bike industry; visitor’s bureaus/tourism; or ethnic/cultural groups. This was the seventh of eight area meetings. The Central Fairfax area meeting is scheduled for the evening of Thursday, March 29, location TBD. Harassment by motorists - Cyclists are tired of being harassed by motorists. We need better enforcement and education. Motorists need to know that bicyclists have a right to ride in the road, and if the lane is not wide enough to share, they can take the lane. It's the law. Horn honking, shouting, and other aggressive actions are illegal. Several cyclists noted that this type of harassment is common. One cyclist said he was hit by a motorist in the presence of a policeman who did nothing. Dedicated funding for bicycle programs and facilities is critical. The plan will not be implemented without funding, and the Board of Supervisors determines which programs are funded. There is dedicated funding for storm water management, ball fields, parks, and other activities, but almost none for bicycling. The county budget public hearings are April 10-12 and we need to speak out for bike funding. FABB is signed up to speak and we'll be sending out an alert asking cyclists to contact the Board of Supervisors (but you don't have to wait until then). Trial maintenance - While there are many paved trails in the county, many don't connect and most are in need of repair or sweeping. There is almost no money for routine maintenance. If there are severe problems, they can be fixed, but the system is rapidly deteriorating and the future is bleak for additional funding. The bike coordinator is trying to overcome lack of funding and administrative hurdles to establish an adopt-a-trail program. Thanks to the cyclists who turned out to provide valuable input into the Bike Plan. We'll need everyone's help to get the plan approved and funded. The kids listened as the little furry Lorax tried, furiously and fruitlessly, to defend his beloved Truffula Trees and Brown Bar-ba-loots from being destroyed by the Once-ler, that greedy Thneed magnate. One of the more dangerous places for kids to bike is around school entrances due to the number of parents driving kids to school, kids who have a seat on a bus or who live close enough to bike or walk. Let's hope Fairfax doesn't allow Mazda to pitch SUVs to our kids. The Fairfax Co Bicycle Master Plan process has been underway since last summer. There are only two more subarea bike planning meetings left. The Centreville/Chantilly meeting will be held on Tuesday, March 6 starting at 6:30 p.m. at the Sully District Governmental Center, 4900 Stonecroft Boulevard, Chantilly. If you're familiar with the western area of the county it's a good chance to provide input to the plan. The Countywide Bicycle Transportation Plan provides recommendations in major areas Quinn calls “the five E’s.” They are engineering, encouragement, education, enforcement and evaluation. Within these areas, the study assesses bike lanes and other on-road bike facilities, bike trails and parking, Bike to Work and School Day, community bike rides, bike safety classes, bicyclist counting and rules of the road, just to name a few. “This is everyone’s big chance to let their county officials know about specific safety problems in their neighborhoods or to alert them to connections that should be added to create better internal access and shortcuts for getting around,” Quinn added. One specific topic residents are open to address at Tuesday night’s meeting is how new and improved bike paths can lead to safer, more convenient ways for locals to commute to work and school. For example, many area schools, like Bull Run Elementary on Route 29/Lee Highway, do not allow any students to bike or walk to school because there is no safe route that allows them to do so. Fairfax County Department of Transportation Bicycle Program Coordinator Charlie Strunk has big plans for the Sully District. County residents who are unable to attend public meetings in their district can give input on the project through an online survey, open through Saturday, March 31. Phoenix Bikes, a community bike shop located in Barcroft Park in Arlington, will hold a used bike sale this Saturday from 10-2pm at Big Bear Cafe in DC. All proceeds will go to support the work at Phoenix Bikes. The County is halfway through the bicycle planning process, which is expected to end in June 2012. The final two subarea meetings are planned for March. The Centreville/Chantilly/Bull Run/Oak Hill/Fair Oaks/Fair Lakes/Westfields meeting will be held at 6:30 p.m. on Tuesday March 6 at the Sully District Government Center, 4900 Stonecroft Boulevard, Chantilly. The Central Fairfax meeting, which includes the City of Falls Church and George Mason University, will be scheduled for later in the month. Most subarea meetings have been well-attended. FABB members serve on the master plan advisory committee and have attended each subarea meeting. To see presentations and read a summary of comments made at the meetings visit the Bicycle Plan Materials & Resources page. See also FABB blog entries about the bicycle plan. A draft bicycle route network is being developed and will be finalized over the next couple of months. A countywide public meeting to present the draft plan is slated for May or June. Please provide input on the plan by attending one of the remaining public meetings or by filling out the online survey. Deadline for filling out the survey is March 31. The plan will set the stage for bicycling in the County for the next 30 years and getting projects into the plan is extremely important. Bicycle-related legislation proposed this year for Virginia was modest. The two major bicycle-related bills would have required motorists to exercise due care when approaching a bicyclist or pedestrian (HB 784) and would have prevented motorists from following bicyclists too closely (HB 785). Unfortunately both bills were defeated by a House Transportation Committee. Northern Virginia’s member of the committee, Del. Barbara Comstock (R-McLean), cast the deciding vote in each case. Cyclists can write to Del. Comstock to express disappointment with her votes. One of FABB’s major goals is to increase the number of children who can bike and walk to school. Until recently the Fairfax County Public School (FCPS) system did not have a clear policy regarding whether kids are allowed to bike to school. Some school principals banned students from biking even if parents wanted their kids to bike. FABB, Washington Area Bicyclist Association (WABA), and Trails for Youth worked with FCPS officials and the School Board to change the policy. In January, the School Board modified the bike-to-school policy so that parents, not principals, can decide whether their kids can bike to school. Another positive development: Two local elementary schools (Terra Centre in Burke and Cunningham in Vienna) have received 2012 funding from VDOT’s Safe Routes to School (SRTS) program. FABB member Jeff Anderson was instrumental in changing the FCPS bike policy. Jeff founded Wolfie's Bike Train at Wolftrap Elementary School in Vienna and was recently profiled in the VDOT SRTS newsletter. Stay tuned for Bike to School Day opportunities on May 9. Last year FABB received funding from the Transurban Community Grant Program to conduct bike commuter seminars, hold bike light giveaways, and install bike parking. After hard work by FABB, the Vienna Bicycle Advisory Committee, and others, the first 3 racks were installed in Vienna in February. Red Mango, a frozen yogurt shop located at 431 W Maple Ave, received two U-racks, and Maple Ave Market, located at 128 E Maple Ave, received one. Check out the racks and thank these businesses for being bike-friendly. Proper maintenance of facilities is a critical safety issue for cyclists who are vulnerable to uneven pavement and potholes. Over the past few years we've documented the deterioration of the Fairfax County Parkway trail. There are many sections where large cracks have appeared and grass grows through the cracks. Contractors have unearthed sections of the trail without repaving them properly. The trail has subsided in some places where it abuts concrete bridges, leaving large gaps that can pop a tire. The trail also diverts from the Parkway, most notably at I-66 and Route 123, without proper way finding signage. The Parkway will be repaved in the near future. Repaving and signing the adjacent Parkway trail has been a priority for FABB for several years. We've been told that VDOT may have the funds this year to repave at least some sections of the trail. FABB volunteers are conducting a reconnaissance of the trail. We're documenting degraded pavement, muddy areas, subsided asphalt at bridges, and other problems by riding the trail, taking pictures, and collecting GPS points. We hope to complete the work in the next couple of weeks, in time for VDOT to develop priorities for repaving. Ideally the entire trail should be repaved. If that is not possible, our work should ensure that sections in most need of repair will be repaved first. FABB now is a member of the Road ID Affiliate Program. If you access Road ID via the FABB website, FABB earns a 10 percent commission when you buy a Road ID product online. Also, the FABB logo is available for engraving on the Road ID dog tag. For more details see the FABB donation page. March 6, Tuesday—Is Bike Sharing Feasible in Tysons? At the Tysons Bike Group meeting Charlie Denney of Alta Planning will discuss what is needed for bike sharing to be successful in a place like Tysons. Alta Bicycle Share, an affiliate of Alta Planning, runs Capital Bikeshare in DC. The meeting is at noon at PwC. All are welcome but space is limited. RSVP to chairman@fabb-bikes.org. Help set the course for making Fairfax County a bicycle-friendly community. The meeting is at the Sully District Government Center, 4900 Stonecroft Boulevard, Chantilly. The meeting is 6:30-9:00 p.m. with a presentation at 7:00 p.m. This is your chance to let the County know what improvements are needed in your area. In the United States in 2009, women accounted for only 24 percent of bike trips, a much smaller percentage than men. But that trend is shifting. The National Women's Cycling Forum will be the first national gathering specifically dedicated to raising awareness about and discussing how to engage more women in bicycling. Grand Hyatt, 1000 H Street, NW, Washington, DC, 2-4:00 p.m. Free, but registration is required. Monthly meeting at 7:30 p.m. at Patrick Henry Library, 101 Maple Ave E, Vienna, near the W&OD Trail. 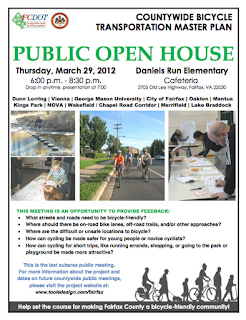 Cindy Engelhart, VDOT NoVa District Bike/Pedestrian Coordinator is scheduled to be our speaker. All are welcome. For more information contact Bruce Wright at chairman@fabb-bikes.org. A few members of FABB will be attending this gathering of bike advocates from around the country. For more information visit the League of American Bicyclists National Bike Summit page. FABB Chairman Bruce Wright will speak about how to get around Reston by bike, with an emphasis on senior cycling. Reston Community Center at Lake Anne, 9:00 a.m.- noon. The event is sponsored by Reston for a Lifetime. Monthly meeting at 7:30 p.m. at Patrick Henry Library, 101 Maple Ave E, Vienna, near the W&OD Trail. Tom Biesiadny, Director of the Fairfax County Department of Transportation, is our invited guest speaker. All are welcome. For more information contact Bruce Wright atchairman@fabb-bikes.org. April 19, Thursday—Vienna Green Expo, 6:30-9:00 p.m., Vienna Community Center. April 24, Thursday—USGS Earth Day Expo, 10:30 a.m.-2:00 p.m., Reston. April 28, Saturday—Paul’s Ride for Life (7:00 a.m. start) and Cyclefest, 10:00 a.m.-3:00 p.m., Reston Town Center. Plan ahead for Bike to School Day (May 9) & Bike to Work Day (May 18)! Fairfax Advocates for Better Bicycling is a sponsored project of the Washington Area Bicyclist Association, aiming to make bicycling an integral part of Fairfax County's transportation network. Visit us on the web at www.fabb-bikes.org, on Facebook, and on Twitter. 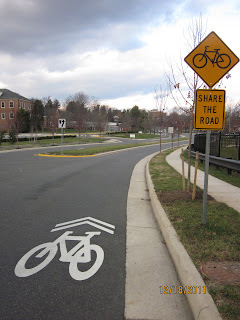 FABB News provides periodic updates on Fairfax County bicycling issues, along with occasional updates and action alerts on breaking news. We encourage all FABB supporters to join WABA at www.waba.org. Donations to FABB are tax deductible. If you would like to support our advocacy work in Fairfax, you can donate online or send a check made out to FABB/WABA to FABB, PO Box 3752, Reston, VA 20195.